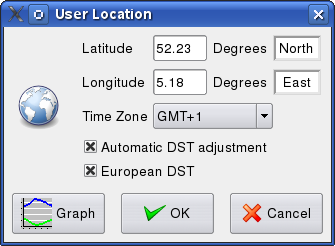 The user loacation should be specified as 0 to 180 degrees east or west of Greenwich and 0 to 90 degrees north or south of the equator. 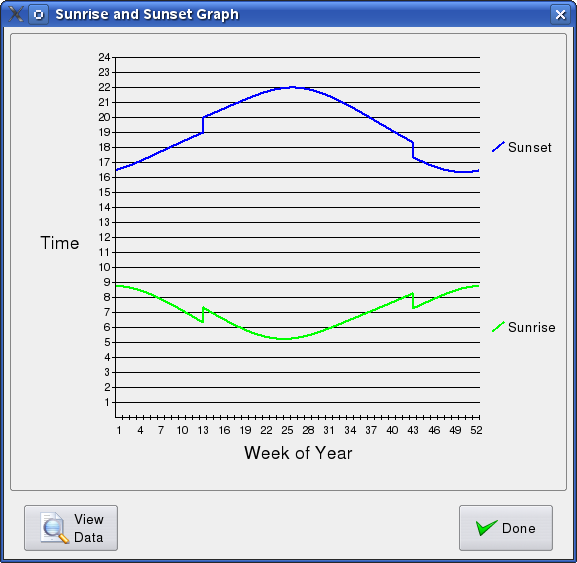 The overview of the sunrise and sunset times resulting from the selected user location are displayed in a graph, just like in the pre-3.0 versions of the Windows software. 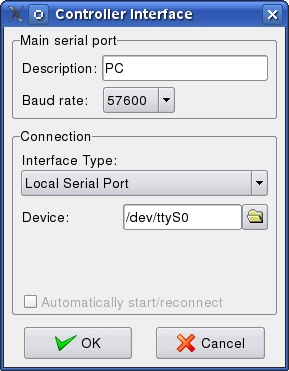 This is the normal method for communicating with a HomeVision controller that is connected to a serial port on the PC where the program is running. Selecting this method will turn the program into a client that connects to a Remote Internet server. The remote Internet server can be another instance of HomeVisionXL, or the original HomeVision software. This makes it possible for a mix of HomeVisionXL and original HomeVision applications to communicate with a single HomeVision controller. This method will connect to a TCP socket for communicatating with the HomeVision controller. This method is useful when some other program is used that acts as a traffic cop for several programs that talk to the HomeVision controller. Like for example Gerry Duprey's HomeVision Network Server program. It can also be used with some ethernet to serial converters. This method will communicate directly with the ProNet network interface from Custom Automation Technologies, without the need to use additional serial port forwarding software. The port forwarding software is only available for Microsoft Windows, so this option allows the use of HV-ProNet with other operating systems. The status of the connection is represented by an icon in the status bar of the main HomeVisionXL window. The connection can be opened and closed very easily by clicking on the icon. Pressing the Shift button while clicking on the icon will bring up the controller interface configuration screen. The Windows HomeVision software provides the ability to use Dynamic Data Exchange (DDE) for other software to communicate with the HomeVision controller. DDE is a Windows specific protocol which does not exist outside the MS Windows environment. To allow other software simultaneous access to the HomeVision controller, HomeVisionXL incorporates a telnet interface that programmers can use when writing software to communicate with the controller. 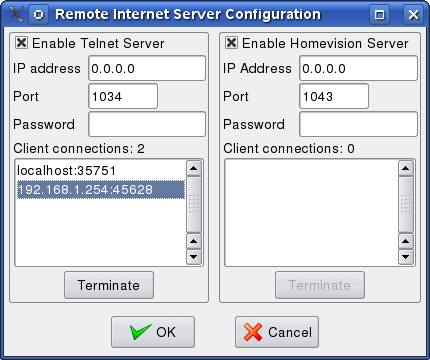 This telnet server capability is controlled from the "Remote internet servers" configuration screen in the Configure menu. The remote internet server in HomeVisionXL will keep track of all incoming connections. This way it is possible to connect remote internet clients from multiple remote machines simultaneously, or different programs using the remote internet interface from the same machine.